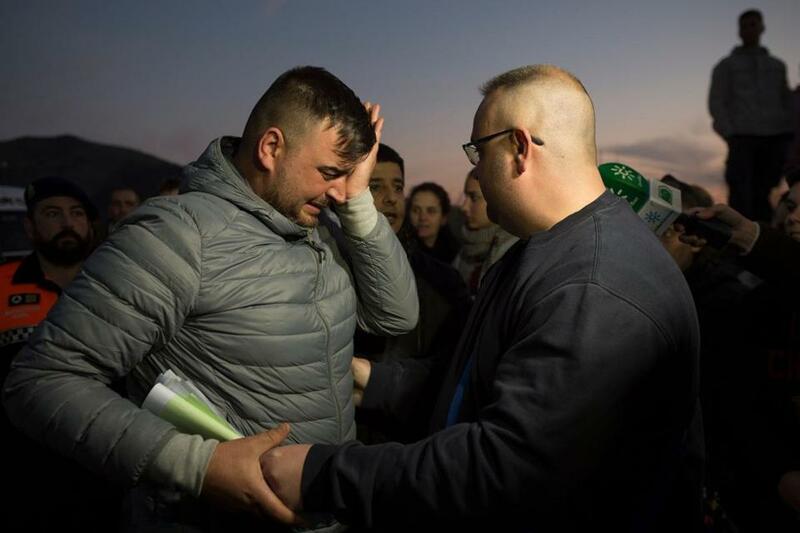 Jose Rosello (left), father of Julen Rosello, 2, who fell down a well, cried as rescue efforts to find the boy continued in Totalan in southern Spain on Wednesday. More than four days have passed since 2-year-old Julen Rosello slipped into a hole in the Spanish countryside, falling more than 30 stories and igniting a search-and-rescue effort that has consumed the country of 46 million people. On Sunday, the boy’s parents said they heard the toddler’s echoing cries as he plummeted into darkness. The tragedy happened as the family of three — Julen and his parents, José Rosello and Vicky García — was setting up for a paella picnic in Totalan, a small town on the southern coast of Spain, according to Britain’s Daily Express. Since then, there has been nothing but agonizing silence. A growing team of rescuers — including experts who have helped retrieve trapped miners — has worked around the clock to find Julen, fighting difficult terrain, bad weather, and, most of all, time. On Wednesday, the boy’s father told reporters he was hoping against hope that Julen would be found alive. ‘‘We’re dead inside but with the hope we have an angel watching over us who is going to help him to come out alive as soon as possible,’’ José Rosello said, according to the Daily Mail. On Thursday, rescue teams began digging two tunnels, one vertical and another horizontal relative to the existing borehole where Julen is thought to be trapped, El Pais reported. ‘‘The main thing is to reach the spot as soon as possible, via either one of the options,’’ engineer Juan López Escobar told reporters, according to the Spanish newspaper. Escobar estimated such a project would usually take a month, but that all typical time frames had been thrown out the window because of the uniquely urgent situation. ‘‘We’re working to do it as soon as possible because of the health of the child,’’ he said, according to the Guardian. Joining Guardia Civil, Spain’s national police force, are mine rescue experts from a region in northwest Spain, as well as Swedish experts who helped rescue 33 trapped Chilean miners in 2010, the newspaper reported. Throughout the week, rescuers have recovered grim evidence the boy is somewhere in the hole - but not the boy himself. On Monday, a small robot lowered into the shaft recovered a bag of candy and a plastic cup Julen had been holding when he fell, but it was not able to capture any videos or sounds of the child. On Wednesday, rescuers pulled up some strands of his hair, according to the network Euronews. DNA tests confirmed that the hair belongs to Julen. They remain blind to the deepest parts of the hole. Still, family members and rescue workers have continued to hold out hope that the boy is alive, perhaps trapped in an air pocket. Dozens of people have appeared at the Totalan rescue site to display messages of support for the Rosello family. Some of the signs have read, ‘‘Hope,’’ ‘‘Solidarity’’ or, simply, ‘‘Julen.’’ Others were drawings by children not much older than the trapped boy.